lid open with a large mirror for wearing jewelries. 1th layer can be divided into 2 major parts,1 for ring rolls compartment and the other for beads compartment, each of them could be taken out separately by sliding. the 2th drawer(10.8L*7.6W*1.6 inches)pulls out with 6 compartments for pins and trinkets. the 3th drawer pulls out with 4 compartments while the 4th with no compartments for storaging some other large bracelets,watch or brooches. Well and carefully package in styrofoam box to protect your item in good condition ! Extra Large Size 11.8 inch * 8.1 inch* 10.8 inch (L*W*H).lid open with a large mirror for wearing jewelries. * the drawer(10.8L*7.6W*1.6 inches) could storage jewelries it is divided into 4 small compartments and With 9 rolls for ring displaying. 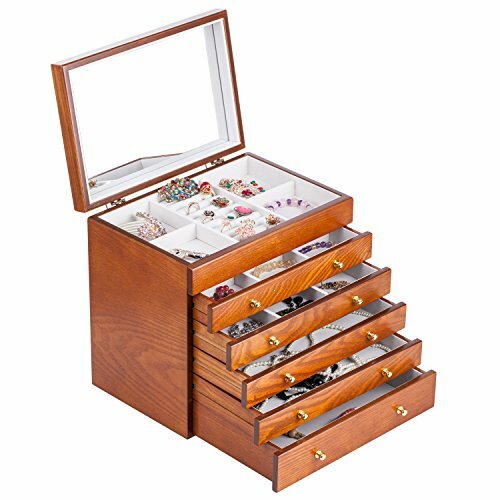 *the 3th drawer pulls out with 4 compartments while the 4th with no compartments for storaging some other large bracelets,watch or brooches.